Win a $10,000 tech sponsorship! LG has lifted the lid on a huge new YouTube competition, which will see the firm give away 30 new UltraWide monitors and $30,000 worth of IT sponsorships. 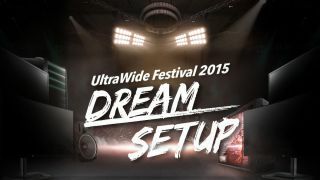 The UltraWide Festival is asking creative-types to take part by creating a video or image showing off their current computer gear setup - for instance, your music-making rig, racks and IT - and submit it via the UltraWide Festival site by 25 September. 30 semi-finalists will then be selected from the entrants and each will get a brand new LG Curved UltraWide monitor with a beautiful 34-inch screen - kiss goodbye to window juggling! However it doesn't finish there. The competition continues as the semi-finalists will then produce a review video explaining how they would use the monitor as part of their dream rig. Three final winning videos will then be chosen by YouTube stars Linus Sebastian from LinusTechTips, Lewis Hilsenteger from Unbox Therapy and Jahova Witniss and the creators will each receive $10,000-worth of their dream gear set-up. The YouTube stars will also help mentor the winners, guide them in spending their hard-won cash and promote a final video about the dream setup. And finally - on top of all of that - there's an all-inclusive trip to Vancouver for a grand finale party with the three finalists, the YouTube stars and a dozen guest fans on 5 December. It's a unique opportunity for YouTubers and any creative-types who with a fondness for tech and chance to get some pointers from pro vloggers, to boot. To get involved head over to the UltraWide Festival website and submit your video by 25 September.